Week 10: Thank You – Where's The Tofu? Sorry for the delay this week, I usually like to get my posts done by Monday but things are a little busy over in Carolyn-land. But it was a wonderful week and I felt strong, my cold completely disappeared, and things just seem to be working. Can’t wait for the coming weeks to see even more improvements! I’m blown away and so grateful that so many people have shown support for my Ironman training in one way or another. To all of you… THANK YOU! I received some very generous donations to my Team in Training fundraiser benefiting the Leukemia and Lymphoma Society this week and it really made me smile ear to ear. I’m training for an Ironman for a lot of different reasons but one of the big ones was to give back to a cause that I’m passionate about. Every week during our TNT group trainings we hear stories about patients going through chemotherapy, about those who have conquered the blood cancer, and those who we have unfortunately lost. Many of the success stories are due to drugs that were funded by the Leukemia and Lymphoma Society; your donations make a difference and are helping to save lives. Your donations not only go to a worthy charity but they also give me the motivation to train harder. So far this season I’ve raised about $6,800 (pending matching gift) and counting! There is no ceiling, no maximum, no stretch goal, I just want to keep raising money until blood cancers treatments and cures are significantly improved. If you’d like to make a donation, even if it’s a dollar, please visit my personal fundraising page: http://pages.teamintraining.org/gba/wildtri14/crohde No amount is too small and every donation makes me smile and helps find cures for blood cancers! Thank you, also, to everyone who has read the blog, sent positive comments on Facebook/Instagram, tweeted motivational messages, or sent texts/e-mails to ask how training is going. I wish I could say I could go through the next 6 months of training solo and independent (as a wee toddler I would say “I can do it a-self”) but knowing I’m not alone in this journey is extremely motivating; I admit that I need the support! I’m so lucky to have a group of amazing friends, family, coaches, teammates, and colleagues who are with me on this crazy rollercoaster ride to Ironman Lake Tahoe. And to all of you… thank you. I normally do my threshold runs at about 8:20-8:40 so this sounds right, but the marathon pace of 9:10? Wow. That would bring me at 4 hours which would be awesome! Photo credit: Kim Polite. 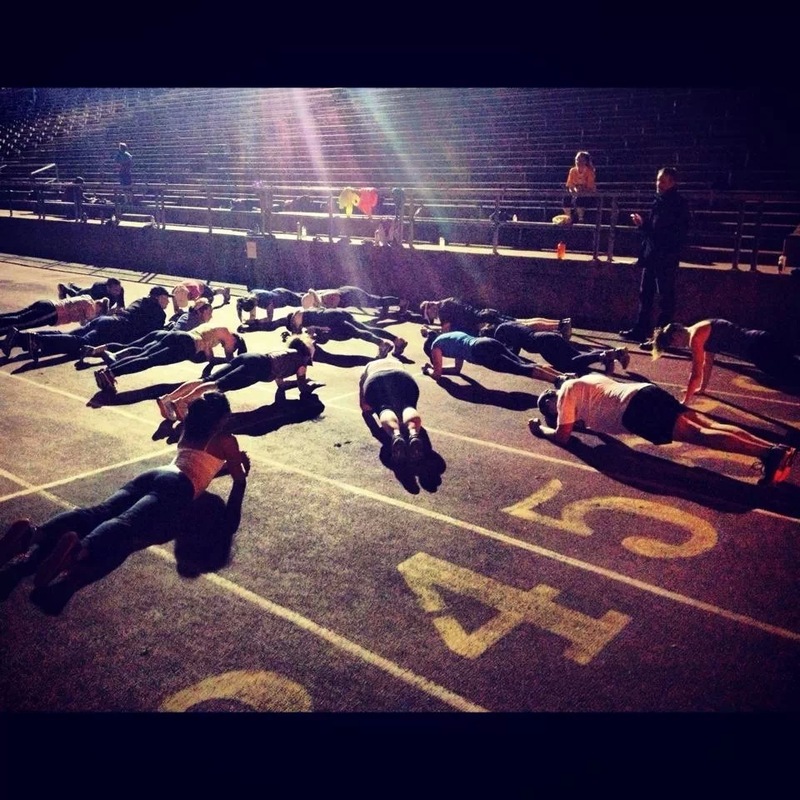 Plank-off at Wednesday night track! Biking: On Saturday we repeated a route we had done a few weeks ago. When we did it a few weeks ago it was supposed to be a “time trial” as fast as we could. But this Saturday it was just instructed that we go at a comfortable pace. I was looking at some of my Strava output and noticed that some of the big climbs and many of the segments were actually faster this week than during our time trial a few weeks ago. And on top of the bike we swam for over an hour before our ride this week! I’m pretty surprised but I’m happy to see some improvements in my efficiency and strength on the bike. By the way, have I mentioned how much I absolutely LOVE riding my bike? I love the scenery, the wind in my face, the sweat, the sound my shoes make when I clip in, the smell of fresh air, the sight of cows grazing in the grass. The whole experience is magical and a little addicting! Swimming: I’m not sure if I’m seeing a TON of swimming improvements, but I do know that I feel much more comfortable going longer distances without breaks. A few weeks ago I was huffing and puffing and resting quite a lot and only lasting 30-40 minutes in the pool, now I can go 1 hour+ a little easier. I’m also getting a lot of really great instruction on my swimming technique from our Team in Training coaches. This week I learned that when I breathe I lift my head slightly up, but I should only be turning to the side, almost as if I’m looking behind me. Loraine told me to visualize holding a tennis ball or apple between my neck. By improving this technique I’ll be less likely to drop my hips when I breathe and will stay on top of the water a little better. Something to work on, for sure! Thursday night I was mentally exhausted, it was cold outside, dark, I was working late, the wind was howling, and my warm apartment and hot soup (ok fine, Chipotle) were calling my name. The absolute last thing I wanted to do was go outside in my bathing suit and jump in the cold pool and swim 2,000 yards. No way, no how, not gonna happen. Then I started rationalizing it… I thought again about my marathoner friend Kellen training in freezing cold Boston, I thought about how much better I would feel if I did my training for the day, I thought about how the cold and wind were just excuses and that I needed to overcome those barriers, I thought about our honorees and how much they have to go through during cancer treatment, and I thought how over time my brain would re-wire such that swimming is natural and easy and not something I dread. So what do you think I did? I went to the damn pool. And I crushed 2,075 yards. I felt amazing afterwards and was really proud that I didn’t just take the easy way out. I’ll never be prepared for Ironman if I take the easy road. It’s about hard hard work, dedication, and staying focused. I had a really weird dream this week about race day in Tahoe. I dreamt that I didn’t set up my transition area or my special needs bags. That I didn’t have any of the right gear and I had to bike in my bathing suit and then beg and plead someone to lend me some running shoes. And then in transition area, nobody ate Gu or Clif bars, nope, food came in the form of required sit-down meals with white table cloths. It was so weird. What does it mean??! 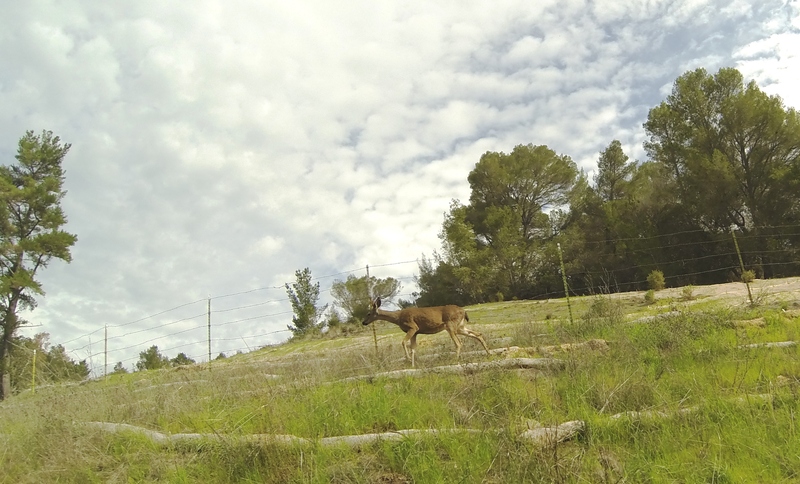 Speaking of nightmare, check out the most recent photo courtesy of one of our coaches, Kim, who went to the Wildflower site this past weekend for training. Wow. The race committee is reassuring everyone that the race will go on, just probably at a different swim location. But still… wow. Photo credit: Kim Polite. 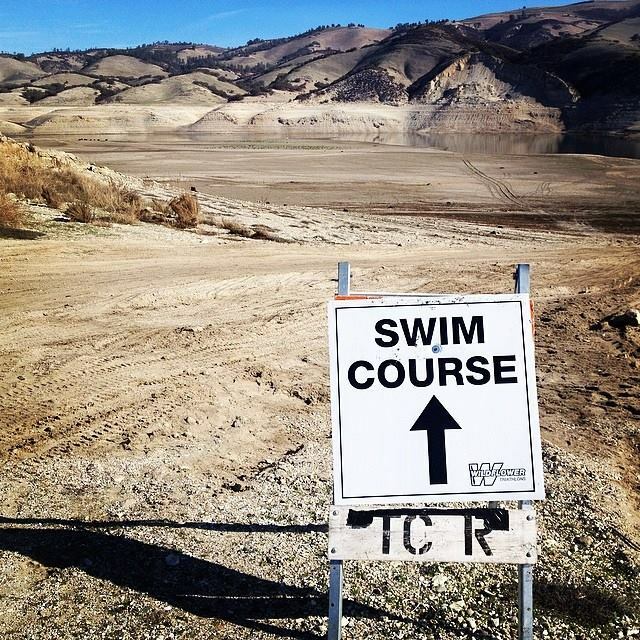 Wildflower Triathlon on May 3rd is supposed to be in this lake. 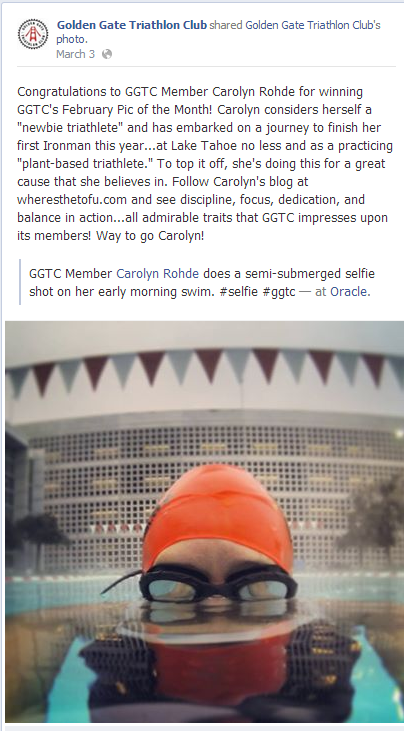 A special thank you to the Golden Gate Tri Club for choosing my “swim selfie” as their February picture of the month! I “won” a GGTC visor and also got a swim cap in the mail. Free schwag!! I’m really blown away by how welcoming and friendly this group is. I didn’t really know anyone in the club when I joined this year but certain people have gone out of their way to get to know me and make an effort to introduce me to other people. Everyone is friendly, encouraging, and just looking to have fun. 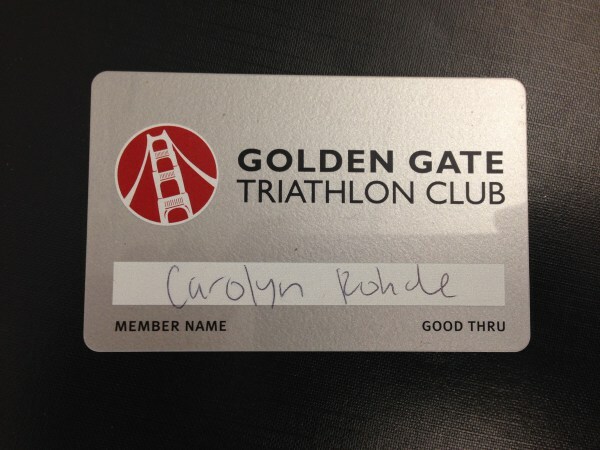 I’ll miss my Team in Training family but I’m excited to spend more time with GGTC post-Wildflower and through Ironman! Saturday we met in San Rafael at 8:00am for a swim and bike workout. 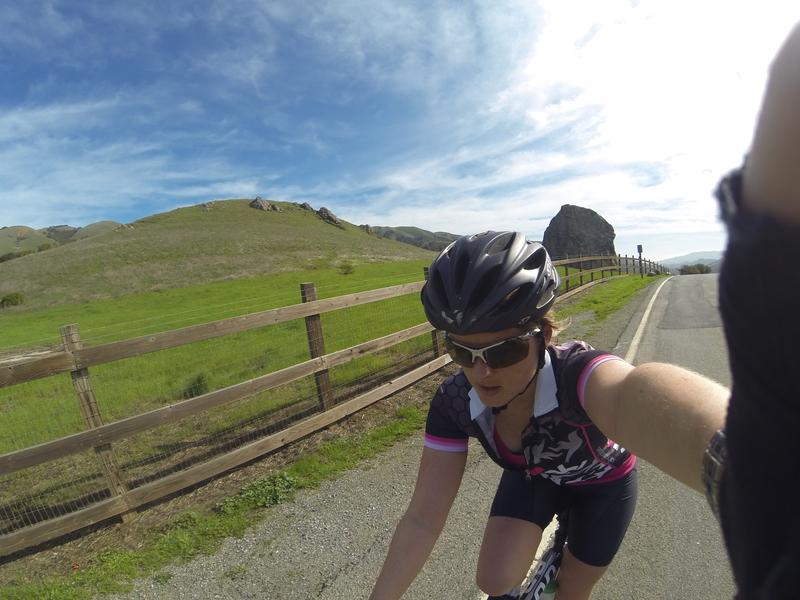 It was one of those perfect, sunny, warm days in the Bay and I was so excited to get the workout started. Half of our team was at the Wildflower training weekend (I couldn’t go) near the race course and we definitely missed them! Swim: We swam in a warm pool for a little over an hour. We did drills, practiced kicking, pulling, balancing, breathing, and sighting. Sighting is particularly important for triathlons because you need to look UP every so often to make sure you’re not swimming off course. But sighting can really slow you down if you look up, drop your hips, and drag your legs. So the tip we learned was to breathe and sight at the same time. So instead of turning your head to the side, breathing, then looking up and straight ahead, you want to look up and breathe simultaneously. It felt a little weird to do this but practice will make it better. Bike: The sun was shining and the cows were mooing. We found ourselves out in farmland for our 38 mile bike ride which was beautiful — tons of lush green, rolling hills with animals roaming freely and not a ton of car traffic. 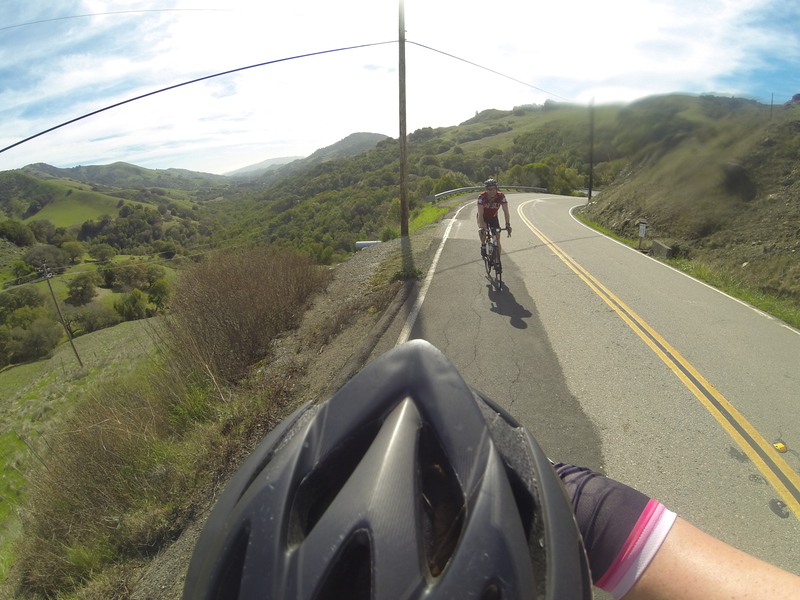 We did some challenging climbs which will help prepare us for the Wildflower Long Course (a very hilly bike course!). Chris and I leapfrogged each other most of the way and kept each other nice and speedy. I ate a banana pre-ride, a Picky Bar, 2 orange slices and a bottle of Nuun. Felt really good! Did I mention how much I love riding my bike?! Almost as fun as riding my bike is heading out for long runs, especially on soft trail surfaces. On Sunday we didn’t have any group training scheduled so I started Googling a few trails in the peninsula (was headed into work after) and the most popular and highest rated trail seemed to be Sawyer Camp. I decided to drive down and give it a try; why not? I like to vary my running routes, it gives me a chance to experience a new part of the Bay Area and also keeps my brain challenged with new scenery. 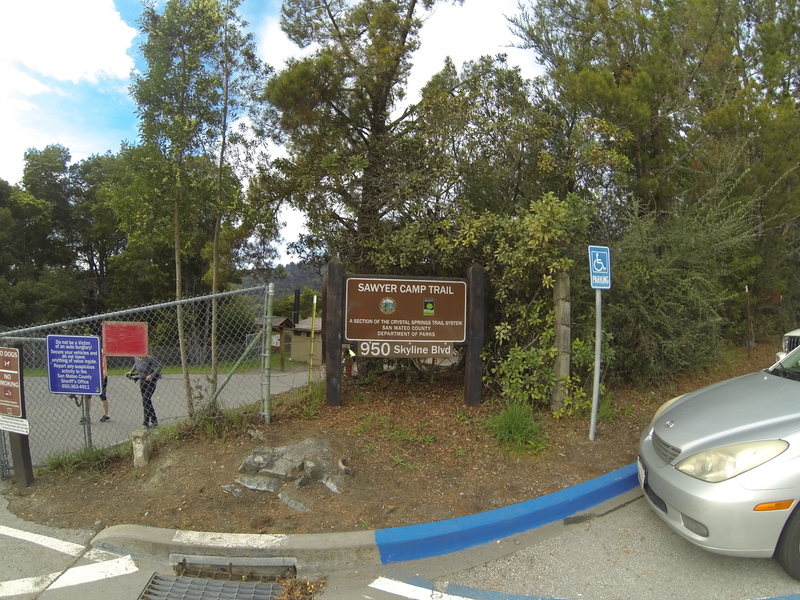 I absolutely loved the Sawyer Camp trail. 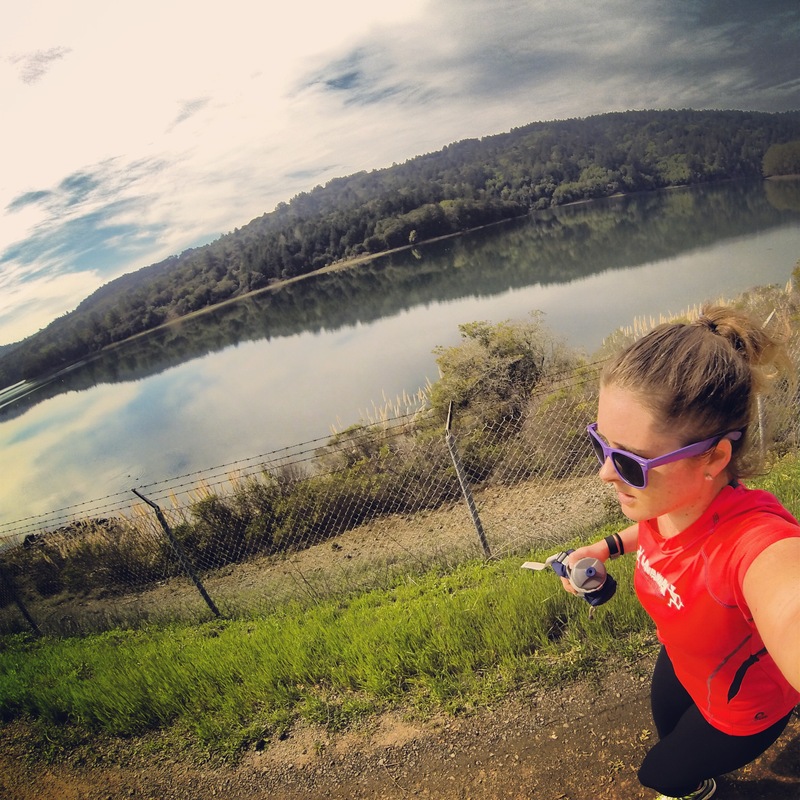 It’s a 6-mile out-and-back that follows the Crystal Springs Reservoir. I chose to do 5 miles out and came back for a total of 10 miles. I wouldn’t describe it as “hilly” especially when compared to the San Bruno mountains, but the rolling hills challenged my legs and my lungs. Want to run the trail? You can park on the street and the trailhead is located at Crystal Springs Rd & Skyline Blvd, San Mateo, CA. Enjoy!! It was a beautiful morning and I was happy that I pushed myself to go the distance. I wore my Hoka One One Kailua trail shoes because I think I’m going to wear them during Wildflower (the run course is mostly trails) and wanted to test them out. They were perfect! Great purchase. I really like to keep my “cooking” simple and easy. So a few nights ago I made a Mexican-inspired bowl-o-stuff to keep for the week. I didn’t follow a recipe or measure anything I just threw some stuff in a bowl and mixed it together. And it was so good!! 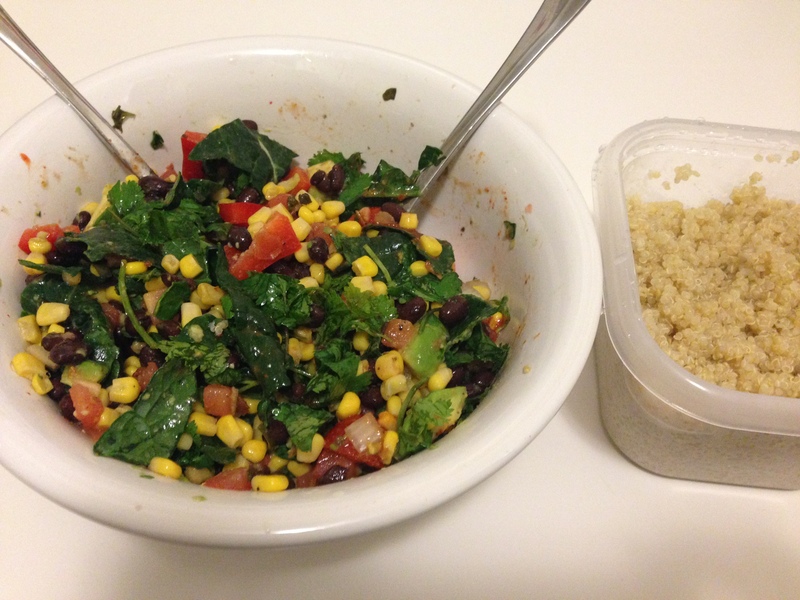 I put together some quinoa, black beans, corn, cilantro, red pepper, kale, onion, garlic, lemon juice, sriracha. The point is, you don’t have to get fancy with your pre-planned dinners, just throw some stuff in a bowl and call it a quinoa salad. If you’re not listening to the Rich Roll podcast, you’re missing out. Big time. The guy inspires me every week. Saturday the 8th. Swim. 2,400 yards of drills and a little speed effort. 1 hour 8 minutes. Thursday the 6th. Swim. Drills and descending sets. 2,075 yards. Tuesday the 4th. Bike. Spin class 45 min. Monday the 3rd. Swim. Drills and continuous swim in the rain. 1225 yards. 37 minutes. Monday the 3rd. Yoga. Warmup jog and morning Vinyasa yoga.